The interior monitoring system and anti-tow alarm trigger an alarm if movement is detected inside the vehicle or if the vehicle is lifted when the vehicle is locked. 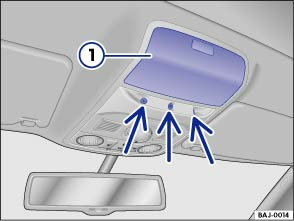 Close the stowage compartment in the roof console , as the correct function of the interior monitoring system (arrows) cannot be guaranteed. Lock the vehicle using the vehicle key. When the anti-theft alarm is switched on, the interior monitoring and anti-tow alarm are also active. The orientation lighting in the button must be lit up when switching the systems off. 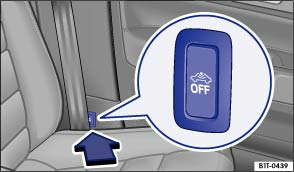 To switch the orientation lighting on, remove the key from the ignition or open one of the doors. Press the button. A yellow indicator lamp will light up in the button until the vehicle is locked. Close all doors and the tailgate. Lock the vehicle using the vehicle key. The interior monitoring and anti-towing alarm are switched off until the next time the vehicle is locked. If you leave animals inside the vehicle for a short period . If the vehicle is to be loaded onto another vehicle. If the vehicle is transported (e.g. on a ferry). If the vehicle is going to be towed with one axle off the ground. If a window is fully or partly open. If the stowage compartment in the roof console is open. If the panoramic sliding roof is fully or partly open. If items such as loose pieces of paper and items attached to the interior mirror (e.g. air-fresheners) are left in the vehicle. If there is movement inside the vehicle when the net partition is in position (when the auxiliary heater is running). If a mobile phone that is left in the vehicle vibrates. If doors or the tailgate are still open when the anti-theft alarm is activated, only the anti-theft alarm is activated. Interior monitoring and the anti-tow alarm are not activated until all doors and the tailgate are closed.